"Džeko" redirects here. For other people with the same surname, see Džeko (surname). Edin Džeko (Bosnian pronunciation: [ědin dʐêːko]; born 17 March 1986) is a Bosnian professional footballer who plays as a forward for Serie A club Roma and the Bosnia and Herzegovina national team, for which he is captain. He was named Bosnian Footballer of the Year for three years in a row. He has been nicknamed "Bosnian Diamond" or simply "Diamond" (Bosnian: "Bosanski Dijamant" or "Dijamant") by football fans and journalists in Bosnia and Herzegovina. Prior to joining Roma, he played for Manchester City, but he made a name for himself while playing for German club VfL Wolfsburg, with whom he won the Bundesliga in the 2008–09 season. He was second-highest goalscorer with 26 goals. In the 2009–10 season, Džeko was the top scorer with 22 goals. He also registered ten assists in both seasons. During the 2011–12 Premier League season, Džeko scored four goals in one game for Manchester City against Tottenham Hotspur at White Hart Lane. On the final day of that season, he scored an equaliser against Queens Park Rangers in the 92nd minute, before Sergio Agüero won it for City with seconds to go, ensuring the team won a league title for the first time in 44 years. He later stated that the goal was one of the most important of his career. On 3 March 2018, Džeko scored his 50th league goal for Roma, thus becoming the first player ever to score 50 goals in three of Europe's top five major leagues. A former youth international for Bosnia and Herzegovina, Džeko made his senior international debut in 2007, earning 99 caps and scoring 55 goals since. Džeko became the highest Bosnia and Herzegovina goalscorer of all time on 7 September 2012 in a game against Liechtenstein where he scored a hat-trick to surpass Zvjezdan Misimović and Elvir Bolić. On 11 September 2018, in a game against Austria, he played his 95th game for Bosnia and Herzegovina and surpassed Emir Spahić to become country's most-capped player. His ten goals in the qualifying campaign helped his national team qualify for its first international tournament, the 2014 FIFA World Cup. Džeko began his career at Željezničar, playing as a midfielder between 2003 and 2005, but with little success playing in that position. He was widely regarded as too tall, and with poor technical abilities. Džeko's coach at the time though, Jiří Plíšek, saw his potential and when Plíšek returned home, he advised Teplice to buy him. Željezničar accepted a bid of just €25,000 for Džeko, one of Željezničar's directors saying years later, "[we] thought we won the lottery". Džeko had a loan spell with Ústí nad Labem in 2005, during which he scored six goals in 15 games. Later that year, he moved back to Teplice, staying there until 2007. With 13 goals in 30 games, he was the second-top goalscorer of the Czech League in the 2006–07 season. Due to his performances, VfL Wolfsburg manager Felix Magath signed him for €4 million. 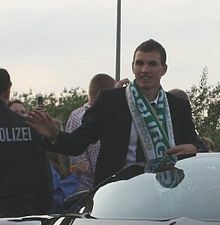 Džeko as winner of Bundesliga with VfL Wolfsburg in 2009. After moving to Wolfsburg, Džeko scored five goals and recorded three assists in 11 games. He was also named by Sportal as the best striker in the first half of the 2007–08 Bundesliga season. During his first season in Germany, Wolfsburg finished in fifth place, qualifying for a UEFA Cup spot for the 2008–09 season. Džeko finished the 2007–08 season with eight goals and seven assists in 17 games started. After Wolfsburg acquired fellow Bosnian international Zvjezdan Misimović in July 2008, Džeko's performances improved significantly in the 2008–09 season. During the first half of this season Edin scored five goals and added seven assists, but after the winter break entire team improved significantly, with Džeko scoring 21 goals and adding three more assists. This was especially visible during the 10 games winning streak from 7 February to 26 April 2009, in which he scored 11 goals and added 1 assist. In May 2009 Džeko scored hat-trick against 1899 Hoffenheim, and again, just two weeks later, against Hannover 96, contributing overall 26 goals and 10 assists in 32 league matches to the team title winning 2008–09 campaign. His goal tally was second only to teammate Grafite, with whom he formed the most successful strike duo in Bundesliga history, and with the team's main assists and key pass provider, Zvjezdan Misimović, who himself broke longstanding Bundesliga record in assists by providing 20, they formed "the magic triangle". Wolfsburg ended the season as Bundesliga champions for the first time in the club's history. They finished two points clear of their title rivals for that season, Bayern Munich, whom they defeated 5–1 a month earlier, in memorable game with Džeko and Grafite scoring two goals each with later scoring his second and team's fifth with memorable backheel, and in which Wolfsburg, in third place at that point, exceeded Bavarians in second to take decisive lead for the first time and went through to keep the league top spot for the rest of the season eventually winning it. In the DFB-Pokal, he scored six goals in two matches, and in the UEFA Cup, four goals and two assists in eight matches as the club reached the final of the tournament. These performances resulted in him being given the Bundesliga Players' Footballer of the Year award. Despite attracting interest from AC Milan, Džeko decided to stay, renewing his contract until June 2013. He scored his first UEFA Champions League goal on 30 September 2009 against Manchester United in a 2–1 defeat at Old Trafford. He was one of 30 players nominated for the 2009 Ballon d'Or. He was top scorer of the Bundesliga in the 2009–10 season with 22 goals scored. On 28 August 2010, Džeko became the top league scorer in the club's history with 59 goals in 96 appearances, surpassing Diego Klimowicz who scored 57 goals in 149 games. At the winter break stage of the 2010–11 Bundesliga season, Džeko had scored 10 goals in 17 matches. After heavy speculation, Roberto Mancini, manager of Manchester City, confirmed on 3 January 2011 that a fee of £27 million (€32 million) had been agreed with Wolfsburg for Džeko, which was City's second highest transfer figure, after Robinho's £32.5 million (€42.5 million) move from Real Madrid in 2008. The transfer fee was the sixth highest in the Premier League history at the time. Also, the sum broke the Bundesliga record departure transfer fee, Bosnian record transfer fee, as well as that of any player from ex-Yugoslavia at the time. The previous ex-Yugoslav record stood for more than a decade – the transfer fee paid by Real Madrid to Fenerbahçe for Elvir Baljić in 1999 (€26 million). In August 2014 he signed a new four-year deal with the club, taking his contract up to 2018. Edin Džeko celebrates winning the 2011 FA Cup with Manchester City. Following his medical examination in London he travelled to Manchester on 5 January, and on 7 January, Džeko was confirmed as a Manchester City player, joining the club on a four-and-a-half-year deal. He made his debut for the club in a 4–3 win over Wolverhampton Wanderers on 15 January in which he set up Yaya Touré for the third goal of the match. Džeko marked his FA Cup debut on 30 January 2011 with the equalising goal in Manchester City's fourth round match against Notts County which ended in a 1–1 draw. In the replay on 20 February, Džeko again scored, helping Manchester City progress to the next round with a 5–0. Džeko scored twice against Aris Thessaloniki within four and a half minutes at the City of Manchester Stadium in the second leg of the last 32 of the UEFA Europa League on 24 February 2011. His last goal was against Bolton Wanderers on the final day of the season and guaranteed City third place in the Premier League over Arsenal and automatic qualification into the group stage of the 2011–12 UEFA Champions League. On 14 May 2011, Džeko was an unused substitute in Manchester City's 1–0 win over Stoke City the 2011 FA Cup Final, winning his first trophy with the club. Džeko started his second season with City by scoring the team's second goal in a 2–3 defeat against Manchester United in the FA Community Shield. In his third Premier League game of this season, Džeko scored four goals against Tottenham Hotspur. In this game, Džeko broke another record by becoming the first Manchester City player to score four goals in one Premier League match. His tally of six league goals in three games won him the Premier League Player of the Month award for August. Further on, he grabbed some important goals such as a header against Wigan Athletic that sealed a 1–0 win for City and extended their lead over title rivals Manchester United to three points, and a goal that put Manchester City 2–0 up against Porto in the Europa League, as they won 6–1 on aggregate. He also scored a headed goal against Blackburn Rovers, which put Manchester City 3–0 up, and sealed the game, this subsequently maintained City's narrow two-point margin over Manchester United. Bosnia and Herzegovina national manager Safet Sušić urged Džeko to leave City at the end of the season because of lack of first-team football towards the end of the season, with the likes of Juventus and Bayern Munich interested. On the final day of the season, Džeko scored a 92nd-minute equaliser before Sergio Agüero scored in the 94th minute to beat Queens Park Rangers 3–2 and secure the Premier League title, the club's first in 44 years. Following his goal that helped win the championship, his 19th goal and 40th appearance in all competitions, Džeko's agent denied reports that the striker would leave City saying it was all media speculation. Manchester City teammates Sergio Agüero, Edin Džeko and David Silva. Džeko began the new 2012–13 season with an equalising goal against Southampton in a 3–2 win. He scored another goal against Queens Park Rangers taking his tally to two goals in the opening three games. He then scored the first goal of City's Champions League campaign against Real Madrid at the Santiago Bernabéu. On 29 September, he scored an 87th-minute winner away at Fulham, one minute after appearing as a substitute. On 20 October, he came off the bench in the 79th minute to score a minute later. He scored a second goal two minutes into stoppage time to seal a comeback win for 10-man City against West Bromwich Albion. On 11 November, Džeko scored another late winning goal as a substitute with a left footed volley in the 88th minute against Tottenham Hotspur. On 29 December 2012, he scored two goals against Norwich City in a 4–3 victory. He finished the season with 14 goals in the Premier League and 15 overall. On the opening day of the 2013–14 Premier League season, Džeko was selected to start by new manager Manuel Pellegrini against Newcastle United at the City of Manchester Stadium. He scored his first goal in a 3–2 defeat at Cardiff City. Džeko scored his 50th goal in England with an only goal of the game against Crystal Palace on 28 December 2013. On 25 March 2014, Džeko scored twice in a 3–0 Manchester Derby win against Manchester United. His first goal came after just 43 seconds, making it the fastest away goal scored at Old Trafford in Premier League history. On 27 April, he scored City's first goal of a 2–0 defeat of Crystal Palace at Selhurst Park, closing the gap on league leaders Liverpool to three points with a game in hand. He scored a brace in City's match at Everton on 3 May, helping City to a 3–2 win and lift the club to the top of the table with two matches left. His second goal of the game was Man City 150th goal in all competitions. In City's penultimate game of the season against Aston Villa, Džeko scored two second-half goals as City won 4–0, ensuring that the club would be crowned champions with a draw against West Ham United at home on the final day, which City eventually won. On 17 August 2014, Džeko assisted David Silva for Manchester City's first goal of the 2014–15 season in a 2–0 defeat of Newcastle United. On 20 August, Džeko signed a new four-year contract with the club, tying him to Manchester City until 2018. On 24 September, Džeko scored his first two goals of the season as Manchester City beat Sheffield Wednesday 7–0 in the third round of the Football League Cup. On 27 September, he again scored twice in Manchester City's 4–2 win away to Hull City to record his first goals of the Premier League season. On 21 February 2015, Džeko ended a run of 15 matches without a goal by scoring Manchester City's third goal in a 5–0 home victory against Newcastle United. After months of speculation during the 2015 summer transfer market, Džeko officially signed for Serie A outfit Roma on 12 August 2015, on a €4 million loan with an €11 million option to buy that would become mandatory after certain performance related goals were met. These clauses were activated on 1 October 2015, making Džeko a permanent member of Roma. He made his Serie A debut ten days after his move from Manchester City, playing the entirety of a 1–1 draw at Hellas Verona, and in his second appearance on 30 August, he scored the winning goal in the 79th minute to defeat reigning champions Juventus 2–1 at the Stadio Olimpico. On 21 February 2016, he scored his first brace for Roma, scoring the first and last goals in a 5–0 win over Palermo. After a disappointing first season with the club, in which Džeko scored only 8 Serie A and 10 goals in all competitions for Roma, he started the 2016–17 season with 12 goals in 15 games, 17 goals in 20 overall, thus equaling the start of the season that Gabriel Batistuta had, in which he won the league title with Roma. On 24 November 2016, he scored a hat-trick in the Europa League, in a 4–1 win over Viktoria Plzeň. On 16 February 2017, he also scored a hat-trick in the first leg of a Europa League match against Villarreal, which Roma won 4–0. On 12 March 2017, he became the fourth Roma player to reach 30 goals in all competitions in a season. On 1 April 2017, Džeko became the first Roma player ever to reach 33 goals in a season in all competitions, surpassing the previous record of 32 goals jointly held by Rodolfo Volk and Francesco Totti. He ended the season with a tally of 39 goals in all competitions of which his 29 goals in Serie A made him the Capocannoniere for that season becoming the first Bosnian player to do so. Džeko started his third season at the Roman club with six goals in first five league games. He scored his first goal of the season against Internazionale on 26 August 2017, which Roma lost 1–3. In the next two games, he scored two braces, against Verona and Benevento. He continued his goalscoring form by opening the score against Milan on 1 October, in a 2–0 win away at San Siro. On 9 October, Džeko was one of 30 players to be nominated for the Ballon D'Or 2017 prize by French newspaper France Football. Džeko then scored a brace against Chelsea at Stamford Bridge on 19 October. The game ended in a 3–3 draw. His next big game of the season came against Napoli, in which he scored a brace and helped his team to a 4–2 victory. Džeko also helped Roma reach UEFA Champions League quarter-finals by scoring the winning goal against Shakhtar Donetsk. Džeko was instrumental in Roma's qualification to UEFA Champions League semi-finals, their first in over 30 years. He scored in both quarter-final legs against Barcelona, which Roma won on away goals. In the semi-finals, Džeko scored in both legs, but it wasn't enough, as Roma were eventually eliminated by Liverpool 6–7 on aggregate. Džeko ended the season with 24 goals, 16 of which he scored in Serie A, making him club's best goalscorer in the league and joint sixth overall. He also added 8 goals in Champions League, which meant he ended as competition's fifth best goalscorer. Džeko started his fourth season with Roma by scoring a winning goal away at Torino on 19 August. Džeko scored his first UEFA Champions League hat-trick on 2 October when he again put three past Viktoria Plzeň, in the 2018–19 UEFA Champions League group stage. He became the first Bosnian to score a hat-trick in the top European club competition. On 13 April 2019, Džeko scored his 8th leage goal against Udinese in the 68th minute, giving Roma a win. Džeko's first appearance for his home country came with the Bosnia and Herzegovina national under-19 football team. He was also part of the under-21 team who played in the play-offs for UEFA European Under-21 Championship hosted by the Netherlands in 2007. Bosnia's first challenges in this competition were Armenia under-21 and Norway under-21. They beat Armenia 3–2 and tied with Norway 1–1, qualifying for the playoff against the Czech Republic under-21. In the first leg, Bosnia lost 2–1; in the second, the game ended in a 1–1 draw. Džeko scored one goal in the tournament. He made his senior debut against Turkey on 2 June 2007. It was a memorable debut for the player, scoring a volleyed goal during the first half stoppage time. The goal levelled the score at 2–2 and Bosnia went on to win 3–2. On 28 March 2009, Bosnian sports commentator, Marjan Mijajlović, named Džeko "the Bosnian Diamond" during a game versus Belgium in Genk in which he scored a remarkable goal. He scored nine goals in 2010 FIFA World Cup qualifying and finished as the second highest goalscorer in 2010 FIFA World Cup qualification, tied with England's Wayne Rooney, behind Greek striker Theofanis Gekas' 10 goals. On 8 September 2012, in an 8–1 win over Liechtenstein, Džeko scored his first hat-trick for the national team and at the same time became the leading goal scorer in the history of the Bosnia and Herzegovina national team with 24 goals. The record was previously held by Elvir Bolić who scored 22 goals. Džeko ended the 2014 FIFA World Cup qualification campaign as second-top scorer with ten goals as Bosnia and Herzegovina qualified for the first major tournament in its history. In June 2014, Džeko was named in Bosnian squad for the 2014 FIFA World Cup. He debuted in the team's opening group match, a narrow defeat to Argentina at the Maracanã Stadium. On 25 June with the team already eliminated, in the final group match against Iran, Džeko scored the opening goal to help Bosnia and Herzegovina to their first ever FIFA World Cup win. In August, following the retirement of Emir Spahić from the international team, manager Safet Sušić named Džeko the new captain. On 28 March 2015, Džeko netted his second international hat-trick, scoring all of the goals in a 3–0 away win over Andorra in UEFA Euro 2016 qualifying, their first win in five games of the qualification campaign. On 13 November 2016, Džeko had an altercation in a 2018 FIFA World Cup qualifier against Greece with Greek player Kyriakos Papadopoulos, in which he pulled down Sokratis Papastathopoulos' shorts while trying to obtain the ball. The subsequent fight between the two teams saw both Džeko and Papadopoulos sent off. It was his first red card in the national jersey. On 28 March 2017, Džeko became the first Bosnian player to score 50 international goals. On 23 March 2019, he made his 100th appearance for Bosnia in a 2–1 win over Armenia in the UEFA Euro 2020 qualifiers. Džeko is renowned for his physical presence, strength and aerial ability. He is also known for shooting the ball with both feet equally well. Wherever he played, he posted impressive goalscoring records, playing mainly as a striker. During his time with Manchester City, he was considered a "super-sub", as he scored many important goals coming off the bench, a label which he himself rejected on several occasions. Džeko was born in Sarajevo, Bosnia and Herzegovina, at that time part of SFR Yugoslavia, to Bosniak parents Midhat and Belma. He stated that his family was always supportive throughout his career, especially his father, who took him to training sessions while he was at Željezničar. His father also played professionally in Bosnia and Herzegovina. Džeko is considered a local superstar in Sarajevo. Džeko is multilingual, speaking five languages fluently: Bosnian, Czech, German, English and Italian. He is a Muslim. Džeko stated that Milan has always been his favourite club and Andriy Shevchenko his favourite player. In his home in Sarajevo, he still has a Milan jersey with the number 7 (worn by Shevchenko while at the club) on the wall in his room. Džeko is a first cousin of former fellow national team player and former captain Emir Spahić. In November 2009, Džeko became Bosnia's first UNICEF ambassador. He has since visited schools and children in his home country affected by the Bosnian War. On 6 July 2012, Džeko was accepted to the University of Sarajevo to study sport and physical education. On 10 September 2018, Džeko graduated with a bachelor's degree from the University of Sarajevo. He has been in a relationship with model and actress, Amra Silajdžić since 2011, marrying her in 2014. In February 2016, he became a father of a girl named Una. His second child, a boy named Dani, was born in September 2017. ^ "Barclays Premier League Squad Numbers 2013/14". Premier League. 16 August 2013. Archived from the original on 5 April 2016. ^ "Edin Dzeko" (in Italian). A.S. Roma. Retrieved 12 September 2018. ^ Mondal, Subhankar (27 December 2010). "Wolfsburg striker Edin Dzeko named Bosnian Player of the Year". goal.com. Retrieved 14 January 2011. ^ Gilmour, Paul (16 October 2018). "Edin Dzeko shines on Sarajevo homecoming against Northern Ireland". Sky Sports. Retrieved 25 October 2018. ^ Menicucci, Paolo (10 January 2017). "How brilliant is Roma's Edin Džeko?". UEFA.com. Retrieved 25 October 2018. ^ "Džeko u Manchester, Grigorije u Mostar" (in Bosnian). Sarajevo-x.com. 7 January 2011. Retrieved 8 January 2011. ^ "'Bosanski dijamant' u Cityju za više od milijun kuna tjedno!" (in Croatian). gol.hr. 4 January 2011. Retrieved 8 January 2011. ^ a b "Edin Dzeko hits four as Manchester City dismantle Tottenham Hotspur". The Guardian. London. 28 August 2011. ^ a b McNulty, Phil (13 May 2012). "Manchester City 3–2 QPR". BBC Sport. Retrieved 15 May 2012. ^ Rhodes, Tom (17 May 2012). "Dzeko happy at Manchester City, says agent". goal.com. Retrieved 17 May 2012. ^ "EXCLUSIVE #askedin – Edin Dzeko QPR important goal – min 2'40". mcfcofficial. 15 July 2012. Retrieved 15 July 2012. ^ "Roma's Edin Dzeko Hits 50-Goal Plateau in Third Major European League". Sports Illustrated. 5 March 2018. Retrieved 28 April 2018. ^ "Može li Džeko ispisati historiju kvalifikacija za Svjetsko prvenstvo?". sportsport.ba (in Bosnian). 8 August 2017. Retrieved 10 August 2017. ^ Sinovčić, Dean (26 May 2009). "Džeko: 'Mislili su da sam balvan'" [Džeko:'They thought I was a log']. Nacional (in Croatian). Zagreb. Archived from the original on 20 October 2014. Retrieved 28 December 2010. ^ a b "Official Website". Edin Džeko. Retrieved 22 January 2010. ^ a b Houton, Jody; Gripper, Ann (6 June 2009). "Edin Dzeko profile: 10 things you need to know about the Arsenal target". Daily Mirror. London. Retrieved 22 January 2010. ^ Wilson, Jonathan (5 January 2011). "Edin Dzeko move to Manchester City pits striker in "my perfect league"". The Guardian. London. Retrieved 5 January 2011. ^ "Džeko potpisao za Wolfsburg" (in Bosnian). ^ "Edin Dzeko 2007–08 statistics". ^ a b c d "Bundesliga: Magic Triangles, a Bundesliga speciality". bundesliga.com. Bundesliga. Retrieved 11 December 2016. ^ "Grafite and Dzeko–A Match Made in Heaven". Goal.com. 23 May 2009. Retrieved 19 June 2009. ^ a b c "1. Bundesliga 2008/09, Stats&Table der 34.Spieltag". kicker.de. Retrieved 11 December 2016. ^ a b Honigstein, Raphael (6 April 2009). "Grafite's signature goal takes Wolfsburg's winning sequence to eight". The Guardian. London. Retrieved 11 December 2016. ^ "Grafite narrt den Rekordmeister!". kicker.de (in German). Retrieved 11 December 2016. ^ "Wolfsburg vs Bayern München – Germany Bundesliga Head to Head (H2H) Statistics & Match Preview". SoccerPunter.com. Retrieved 11 December 2016. ^ "VfL Wolfsburg – Saison 2008/09, 26.Spieltag – Stats & Table". kicker.de (in German). Retrieved 11 December 2016. ^ "Dzeko may stay at Wolfsburg". FIFA. 3 June 2009. Retrieved 19 June 2009. ^ "Dzeko delight at new deal". Sky Sports. 1 August 2009. Retrieved 5 August 2009. ^ "Dzeko extends until 2013". VfL Wolfsburg. 1 August 2009. Retrieved 2 September 2011. ^ Stevenson, Jonathan (30 September 2009). "Man Utd 2–1 Wolfsburg". BBC Sport. Retrieved 22 January 2010. ^ Stone, Simon (1 October 2009). "Man Utd 2–1 Wolfsburg: Giggs rolls back the years to hound out German champions Wolfsburg". Scotsman.com Sport. Retrieved 22 January 2010. ^ "Man United 2–1 Wolfsburg: Carrick Seals Hard-Fought Victory". Goal.com. 30 September 2009. Retrieved 30 September 2009. ^ "Dzeko the best goalscorer of Bundesliga" (in Bosnian). ^ "Džeko najbolji strijelac u historiji Wolfsburga". Sarajevo-x.com. 28 August 2010. Retrieved 28 August 2010. ^ "Man City agree £27m fee for Dzeko". Daily Mirror. London. 3 January 2011. Retrieved 9 May 2014. ^ "Sjaji, sjaji dijamantu!". Sarajevo-x.com. 15 January 2011. Retrieved 16 January 2011. ^ "Džeko nadmašio Gomeza". SportSport.ba. 9 January 2011. Archived from the original on 12 January 2011. Retrieved 10 January 2011. ^ a b "Džeko je kralj transfera SFRJ". MTS Mondo. 7 January 2011. Retrieved 13 January 2011. ^ "Džeko je budućnost, zaboravite Balotellija i Adebayora". Sport Centar. 8 January 2011. Archived from the original on 12 January 2011. Retrieved 9 January 2011. ^ "Džeko gledao City protiv Leicestera sa šalom oko vrata". Sarajevo-x.com. 9 January 2011. Retrieved 9 January 2011. ^ "Džeko jači od Baljića, Kodre i Salihamidžića". San Dnevne Novine. 12 January 2011. Retrieved 13 January 2011. ^ Booth, Mark (20 August 2014). "Dzeko signs four-year deal at City". Manchester City F.C. Retrieved 9 July 2015. ^ "Manchester City sign striker Edin Dzeko from Wolfsburg". BBC Sport. 7 January 2011. Retrieved 8 January 2011. ^ "Edin Džeko asistirao u pobjedi Manchester Cityja". Sarajevo-x.com. 15 January 2011. Retrieved 15 January 2011. ^ "Notts County 1–1 Man City". BBC Sport. 30 January 2011. Retrieved 17 May 2011. ^ Taylor, Daniel (20 February 2011). "Patrick Vieira sets up Manchester City stroll against Notts County". The Guardian. London. Retrieved 17 May 2011. ^ Gardner, Alan (24 February 2011). "Manchester City v Aris Thessaloniki–as it happened". The Guardian. London. Retrieved 17 May 2011. ^ "Dzeko breaks duck for City". ESPN Soccernet. 25 April 2011. Retrieved 26 April 2011. ^ "Dzeko hopes for 'new beginning'". Sky Sports. 26 April 2011. Retrieved 26 April 2011. ^ "Bolton Wanderers 0–2 City". Manchester City. 22 May 2011. Retrieved 22 May 2011. ^ "City vs Stoke". BBC Sport. ^ "Džeko, budalaštine i krkani" (in Bosnian). sarajevo-x.com. 29 August 2011. Retrieved 29 August 2011. ^ "Dzeko named Player of the Month". Daily Mirror. London. 2 September 2011. Retrieved 10 September 2011. ^ Magowan, Alistair (16 January 2012). "Wigan 0–1 Manchester City". BBC Sport. Retrieved 17 May 2012. ^ Dawkes, Phil (22 February 2012). "Manchester City 4–0 FC Porto". BBC Sport. Retrieved 17 May 2012. ^ Custis, Neil (27 February 2012). "Man City 3 Blackburn 0". The Sun. London. Retrieved 17 May 2012. ^ "Bosnia boss urges Dzeko to leave Man City". FourFourTwo. 9 May 2012. Retrieved 17 May 2012. ^ Bohoric, Jure (17 May 2012). "Dzeko plans City stay". Sky Sports. Retrieved 17 May 2012. ^ "Manchester City's Edin Dzeko sinks Tottenham Hotspur with late winner". The Guardian. London. 11 November 2012. ^ "Norwich 3–4 Man City". BBC Sport. 29 December 2012. Retrieved 9 May 2014. ^ "Edin Dzeko". ESPN FC. Retrieved 4 November 2013. ^ "Dzeko, Hart the heroes as City edge Palace". ESPN. 31 October 2006. Retrieved 29 December 2013. ^ "Manchester United 0–3 Manchester City: Moyes' men outclassed as City keep up title hunt". Goal. 25 March 2014. Retrieved 6 May 2014. ^ "Premier League – Toure stars as City beat Palace to close gap on Liverpool". Eurosport. 27 April 2014. Archived from the original on 8 May 2014. Retrieved 7 May 2014. ^ "Manchester City took a significant step towards claiming the Premier League title as they returned to the top of the table on goal difference with victory at Everton". BBC Sport. 3 May 2014. Retrieved 3 May 2014. ^ "City move to brink of title glory". ESPNFC. 7 May 2014. Retrieved 7 May 2014. ^ "Man City striker Edin Dzeko proves why he's worth new five year deal in win at Newcastle". Daily Mirror. London. 17 August 2014. Retrieved 18 August 2014. ^ "Manchester City striker Edin Dzeko signs four-year contract". BBC Sport. 20 August 2014. Retrieved 20 August 2014. ^ "City 7 SheffWeds 0". Manchester City F.C. Retrieved 22 February 2015. ^ Wheeler, Chris (27 September 2014). "Hull City 2–4 Manchester City: Edin Dzeko and Frank Lampard ensure champions keep in touch with Chelsea having surrendered two-goal lead at the KC Stadium with Eliaquim Mangala to blame". Retrieved 28 October 2014. ^ "Man City 5–0 Newcastle". BBC Sport. Retrieved 22 February 2015. ^ "Edin Dzeko: Roma sign Man City striker on season-long loan". BBC Sport. 12 August 2015. Retrieved 12 August 2015. ^ "Operazioni di mercato Edin Džeko" (PDF). A.S. Roma (in Italian). 12 August 2015. Retrieved 12 August 2015. ^ "Roma: Dzeko, Salah, Falque permanent". Football Italia. 1 October 2015. Retrieved 4 October 2015. ^ "Hellas Verona 1–1 Roma: Rudi Garcia's side fail to win opener as Edin Dzeko, Gervinho and Wojciech Szczesny feature for visitors". Daily Mail. London. 22 August 2015. Retrieved 30 August 2015. ^ "Edin Dzeko on target as Roma beat Juventus". The Irish Times. Dublin. 30 August 2015. Retrieved 30 August 2015. ^ "Roma 5–0 Palermo". BBC Sport. Retrieved 23 February 2016. ^ "Nikad bolje otvaranje sezone za Edina Džeku" (in Bosnian). freshpress.info. 12 October 2016. Retrieved 23 September 2017. ^ "Internazionale crash out after Ben Sahar winner for Hapoel Be'er Sheva". The Guardian. London. Press Association. 24 November 2016. Retrieved 17 February 2017. ^ "Europa League: Edin Dzeko hits hat-trick as Roma thrash Villarreal 4–0". BBC Sport. 16 February 2017. Retrieved 17 February 2017. ^ "30 Goals in a Season: Dzeko joins illustrious company at Roma". asroma.com. 14 March 2017. Retrieved 23 September 2017. ^ Campanele, Susy (3 April 2017). "Serie A Week 30: Did You Know?". Football Italia. Retrieved 20 April 2017. ^ "Pogledajte svih 39 golova Edina Džeke" (in Bosnian). ^ "Roma striker Dzeko wins Serie A Capocannoniere". goal.com. 28 May 2017. Retrieved 4 May 2018. ^ "Roma 1–3 Inter, Icardi spegne i sogni giallorossi". quotidiano.net (in Italian). 26 August 2017. Retrieved 3 September 2017. ^ "Roma 3–0 Verona: doppietta Dzeko e Nainggolan". sportmediaset.it (in Italian). 16 September 2017. Retrieved 19 September 2017. ^ "Benevento 0–4 Roma: Dzeko, un'altra doppietta". Corriere dello Sport – Stadio (in Italian). Rome. 20 September 2017. Retrieved 21 September 2017. ^ "Milan 0–2 Roma: Dzeko e Florenzi fanno sorridere Di Francesco". la Repubblica (in Italian). Rome. 1 October 2017. Retrieved 2 October 2017. ^ "De Bruyne, Lewandowski, De Gea, Kane et Dzeko font aussi partie de la liste des 30 nommés au Ballon d'Or France Football 2017". L'Équipe (in French). Paris. 9 October 2017. Retrieved 10 October 2017. ^ "Chelsea 3–3 Roma". UEFA. 19 October 2017. Retrieved 20 October 2017. ^ "Napoli 2–4 Roma: Giallorossi da urlo, calato il poker al San Paolo". Il Messaggero (in Italian). Rome. 3 March 2018. Retrieved 4 March 2018. ^ "Edin Dzeko sends Roma through against Shakhtar and into last eight". The Guardian. London. 13 March 2018. Retrieved 16 March 2018. ^ "Roma srušila Barcelonu za polufinale Lige prvaka: Džeko najzaslužniji za senzaciju". index.hr (in Croatian). 10 April 2018. Retrieved 11 April 2018. ^ "Liverpool lose to Roma, but advance to Champions League final on aggregate amid controversial referee decisions". CBSSports.com. 3 May 2018. Retrieved 3 May 2018. ^ "U Romi nisu zadovoljni: Džeko i Under su jedini sigurni". sportsport.ba (in Bosnian). 22 May 2018. Retrieved 26 May 2018. ^ "Torino-Roma 0–1: Dzeko regala i primi tre punti della stagione". ilmesaggero.it (in Italian). 19 August 2018. Retrieved 20 August 2018. ^ A.Lendo (2 October 2018). "To je naš Dijamant: Džeko prvi igrač iz BiH koji je postigao hat-trick u Ligi prvaka". sportsport.ba (in Bosnian). sportsport.ba. Retrieved 3 October 2018. ^ M.Šljivak (13 April 2019). "Edin Džeko vodi Romu ka Ligi prvaka!" (in Bosnian). sportsport.ba. Retrieved 13 April 2019. ^ "Edin Dzeko beautiful goal against Belgium". Retrieved 14 January 2011 – via YouTube. ^ "2010 World Cup Qualifying Statistics". FIFA. Retrieved 19 June 2009. ^ "Džeko hat-trickom ostavio Misimovića i Bolića iza sebe". sportsport.ba (in Bosnian). 8 September 2012. Retrieved 8 September 2012. ^ "Top scorers". FIFA. Archived from the original on 19 September 2010. Retrieved 16 October 2014. ^ "Bosnia-Herzegovina World Cup 2014 squad". The Daily Telegraph. London. 2 June 2014. Retrieved 3 October 2018. ^ "Bosnia beaten by Messi marvel". FIFA. 16 June 2014. Retrieved 24 March 2018. ^ "Bosnians bid farewell by eliminating Iran". FIFA. 25 June 2014. Retrieved 28 June 2014. ^ "Novi kapiten Edin Džeko: Ovo je velika čast i obaveza". klix.ba (in Bosnian). 8 August 2014. Retrieved 3 July 2015. ^ "Džeko and Lulić combine as Bosnians sink Andorra". UEFA. 28 March 2015. Retrieved 31 March 2015. ^ "Edin Dzeko sent off for pulling player's shorts down in Bosnia World Cup qualifier". The Guardian. London. 14 November 2016. Retrieved 14 November 2016. ^ "Džeko zabio 50 golova protiv 26 reprezentacija". bih.ba (in Bosnian). 28 March 2017. Retrieved 8 May 2017. ^ M. Šljivak (23 March 2019). "Svečanost prije utakmice: Edin Džeko dobio poklon za 100. utakmicu u dresu BiH!" (in Bosnian). sportsport.ba. Retrieved 23 March 2019. ^ Lea, Greg (7 September 2015). "How Edin Dzeko can spearhead Roma's Serie A title bid?". squawka.com. Retrieved 4 March 2018. ^ Jolly, Richard (22 November 2015). "Edin Dzeko is unhappy providing Manchester City's Plan B". The National. Abu Dhabi. Retrieved 4 March 2018. ^ Krishna, Keerthi (16 August 2017). "The rebirth of Edin Dzeko". footballbh.net. Retrieved 4 March 2018. ^ Edwards, John (7 January 2011). "Edin Dzeko: The story behind Manchester City's new striker". Daily Mail. London. Retrieved 4 March 2018. ^ "Comparing the conversion rates of the top scorers in Europe's top five leagues". planetfootball.com. 22 September 2017. Retrieved 4 March 2018. ^ Lott, Greg (12 November 2012). "Javier Hernandez and Edin Dzeko: What Makes a Great Super-Sub?". bleacherreport.com. Retrieved 3 March 2018. ^ Moxley, Neil (21 October 2012). "I'll never be a super sub, roars Dzeko after netting late brace to earn City win". Daily Mail. London. Retrieved 3 March 2018. ^ James, Stuart (13 December 2012). "Edin Dzeko rejects 'super sub' tag after rescuing Manchester City". The Guardian. London. Retrieved 3 March 2018. ^ "Dzeko (9)". vfl-wolfsburg.de. Retrieved 27 March 2008. ^ "World Cup 2014: How the qualifying groups stand around the world?". The Independent. London. 29 March 2013. Retrieved 29 March 2013. ^ "Engleska liga je najjača na svijetu, želim biti najbolji" (in Bosnian). sarajevo-x.com. 8 January 2011. Retrieved 9 January 2011. ^ "Manchester City striker Edin Dzeko will discover there are pitfalls to posturing as a man of the people". The Daily Telegraph. London. 13 January 2011. Retrieved 23 November 2015. ^ "Behind the Scenes: Edin Dzeko photo shoot". Manchester City F.C. 27 January 2011. Retrieved 27 January 2011. ^ "Edin Dzeko 33. gol supera record di Totti". 1 April 2017. Retrieved 1 October 2017 – via YouTube. ^ "Dzeko: From dodging bombs in war-torn Sarajevo to joining the City revolution for £27m". Daily Mail. London. 26 February 2011. Retrieved 15 April 2014. ^ "Džeko: Shevchenkov dres ima posebno mjesto u mojoj sobi" (in Bosnian). sportin.ba. 7 January 2011. Retrieved 7 January 2011. ^ "Magath: Was läuft da mit Dzekos Cousin?". Bild (in German). Berlin. 3 June 2009. Retrieved 21 December 2011. ^ "World Cup qualifying: Is luck finally on the side of Bosnia and Herzegovina?". bleacherreport.com. 12 October 2010. Retrieved 12 October 2012. ^ "Edin Dzeko profile: 10 things you need to know about the Arsenal target". Daily Mirror. London. 6 June 2009. Retrieved 22 May 2012. ^ "Bosnia and Herzegovina marks the 20th anniversary of the Convention on the Rights of the Child". unicef.org. 19 November 2009. Retrieved 1 October 2017. ^ "Edin Džeko upisao fakultet u Sarajevu" (in Bosnian). klix.ba. 6 July 2012. Retrieved 6 July 2012. ^ "Edin Džeko diplomirao na studiju Menadžment u sportu". klix (in Bosnian). 10 September 2018. Retrieved 11 September 2018. ^ "Edin Džeko i Amra Silajdžić dobili kćerku" (in Bosnian). vecernji.ba. 3 February 2016. Retrieved 12 May 2016. ^ "Edin Džeko dobio sina!" (in Bosnian). 6 September 2017. Retrieved 9 September 2017. ^ a b c "E. Džeko: Summary". Soccerway. Perform Group. Retrieved 15 October 2018. ^ "Edin Džeko". eu-football.info. Retrieved 15 October 2018. ^ a b "Edin Dzeko: Overview". Premier League. Retrieved 16 April 2018. ^ "Džekin hat-trick: Novi naslov "Idola nacije"". sportsport.ba (in Bosnian). 23 June 2012. Retrieved 24 September 2012. ^ "Bundesliga Historie 2008/09" (in German). kicker. ^ "Bundesliga Historie 2009/10" (in German). kicker. ^ "UEFA Champions League Squad of the Season". UEFA. 27 May 2018. Retrieved 28 May 2018. ^ "Edin Dzeko is Roma's Player of the Season!". A.S. Roma. 29 May 2018. Retrieved 3 October 2018. ^ "Dzeko top Europa League scorer". Football Italia. 24 May 2017. Retrieved 24 May 2017. 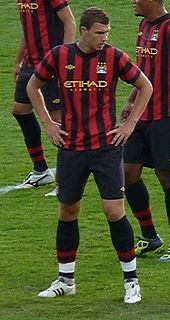 Wikimedia Commons has media related to Edin Džeko.